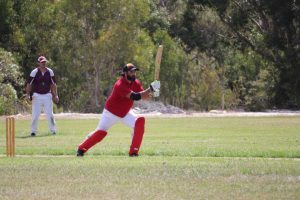 Moving into the final stages of the Gympie Reserve grade cricket competition, the Rainbow Beach Cricket club are still holding a spot on top of the ladder. With only a slight lead over Western Gympie a win was absolutely crucial in their last match versus Valleys. However the side was not only playing for a victory but they were playing in memory of Lionel McBride, the former scorer of Rainbow Beach Cricket Club. Both teams and the family of Lionel came together before the match to remember Lionel McBride. Then it was game time. Rainbow Beach batted first and outstanding efforts from Andrew Simpson (57) and Dean Long (50*) meant that Rainbow put on 150 runs for Valleys to attempt to chase. However, outstanding bowling from Andrew Simpson who picked up 4 wickets and the ‘Man of the Match’ meant it was a stretch too far for Valleys. Rainbow Beach picked up a 60 run victory to remain the competition leaders. For anyone wishing to come down and support our home game on Saturday February 16, it’s at Carlo Road Oval. Also, for anyone wishing to get involved with the club, both on and off the pitch, contact mervoneill@hotmail.com.